When Alec Issigonis was requested by British Motor Corporation (BMC) in late 1956 to develop an economical but nevertheless fully-fledged small car with four seats, it quickly became clear that this new model would be truly innovative and, indeed, revolutionary in every respect. Front-wheel drive, extremely short body overhangs, a wide track, a low centre of gravity, optimum use of space and low weight were defined right from the start as elementary features of the new model. Looking at the first drawings of the new car by his business partner and friend Alec Issigonis, sports car wizard John Cooper noticed yet another significant quality right from the beginning: He recognized that this ingenious concept for an economical compact car also provided the ideal starting point for a most promising sports model, setting out on the process of tuning the Mini even before the car had entered the market. This set the starting point for an unprecedented story of success in motorsport, closely connecting the name John Cooper with the sporting myth of the MINI to this very day. Outstanding victories in the Monte Carlo Rally are just as much part of this common history as the successful production cars proudly bearing the name Cooper. 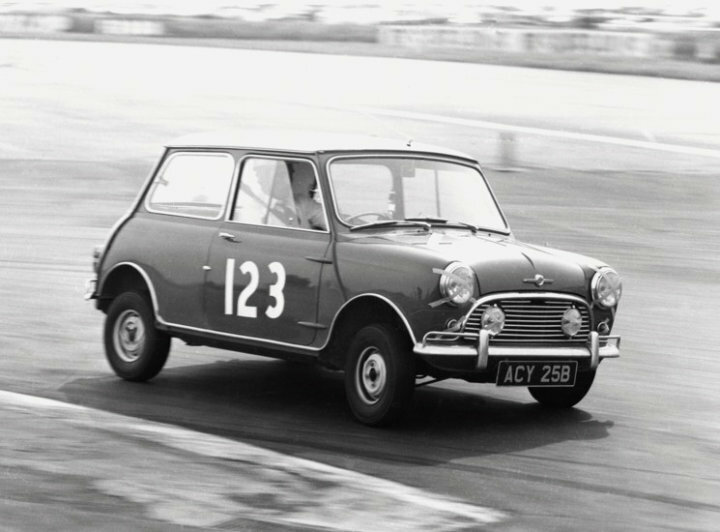 Born in Surrey in 1923, John Cooper was one of the most outstanding celebrities in international motorsport – both as a driver and, even more so, as a constructor. Together with his father he established the Cooper Car Company in 1946, the two enthusiasts starting out with the construction of racing cars first for Formula 3, later also for Formula 1. Through their concept of a mid-engined sports car Charles and John Cooper set a truly revolutionary trend in the entire world of motorsport in 1955, Cooper racing cars winning both the Constructor’s and Driver’s titles in the World Formula 1 Championship in 1959 and 1960, for the first time in the history of motorsport with the engine mounted in the middle. And with this concept proving its success so convincingly, it is no surprise that soon all cars in Formula 1 came with a mid-mounted engine. John Cooper and Alec Issigonis became close friends in the course of time after meeting and competing against one another at numerous races. There were also professional ties between the two enthusiasts, with the Cooper Car Company buying engines from BMC. When it came to the Mini, however, the sporting ambitions of the two constructors were very different: Issigonis was looking above all at the right car for everyday motoring, Cooper was thrilled by the sporting potential of this small and nimble performer. So back in 1959, the very first year of the Mini, he sent his driver Roy Salvadori to Monza in the very first Mini Cooper, a special one-off model built specifically for this purpose. And indeed, this new sports car immediately proved its qualities on the way to Monza, Salvadori covering the distance more than an hour faster than his colleague Reg Parnell – who just happened to be driving an Aston Martin DB4. 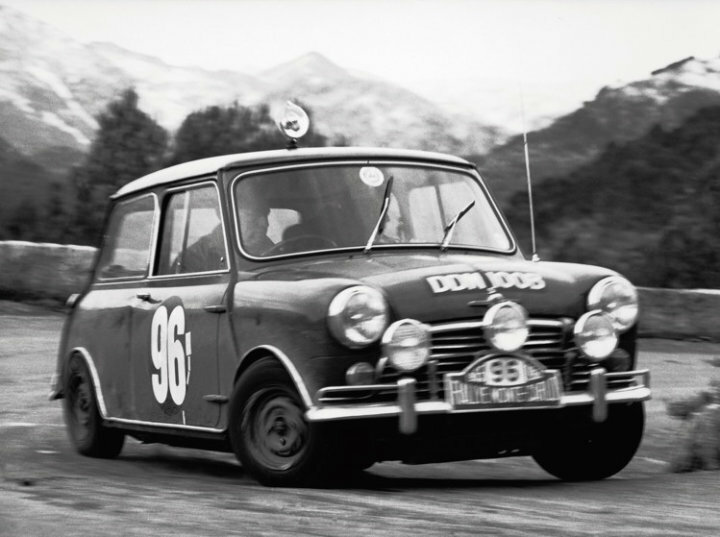 Motivated by initial success in the 1960 Monte Carlo Rally, Cooper suggested building a GT model based on the Mini. And despite Issigonis’ rather sceptical opinion at least to begin with, George Harriman, the Chief Executive Officer of BMC, ultimately decided to build a small series of 1,000 Mini Coopers featuring a 55-hp power unit, that is 21 extra horsepower made possible by far-reaching modifications of the engine. The Mini Cooper’s top speed was approximately 130 km/h or 80 mph. The car’s transmission ratios were adjusted to the sporting potential of the engine and disc brakes on the front wheels ensured adequate stopping power. Soon Issigonis was also thrilled by the results of these efforts. So joining forces with John Cooper, he quickly started working on the next engine upgrade, increasing engine bore to the ultimate limit on the Mini Cooper S: At 1,071 cc, engine capacity remained below the mark of 1,100 cc applicable in the particular class of motorsport seen as the target, with the engine revving up to impressive speeds. Maximum output was 70 hp at 6,200 rpm, maximum engine speed was 7,200 rpm. This version was again equipped with new brakes, braking power being boosted by a brake servo. This set the basis for sensational success in motorsport, the Mini Cooper S hitting the headlines in Monte Carlo for the first time in 1962. With Finnish driver Rauno Aaltonen at the wheel, this small but highly nimble performer successfully left behind a whole pack of far more powerful Goliaths. But just three kilometres away from home, Aaltonen, leading the race at the time, misjudged a bend and finished the Rally with a rollover. Only a year later, however, Aaltonen made up for this misfortune, bringing home class victory in the Mini Cooper S and finishing third overall. 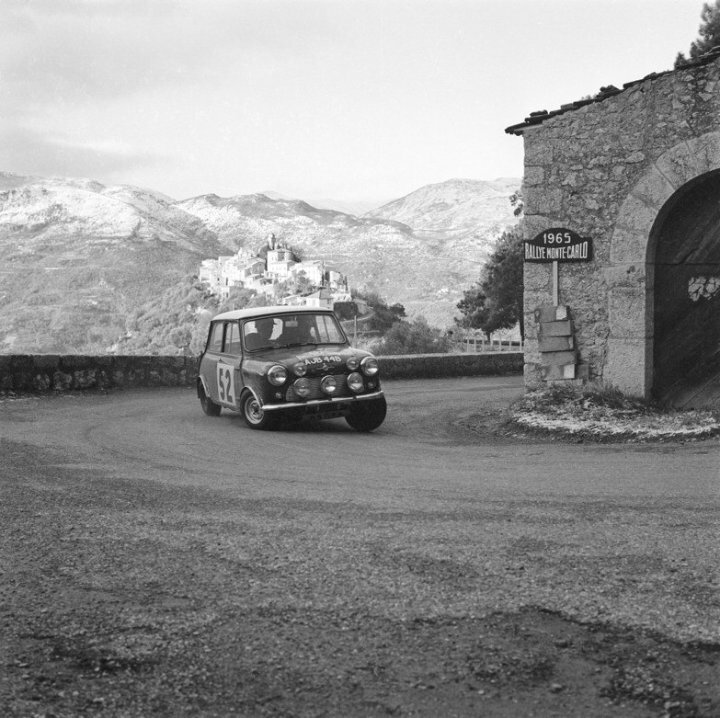 But even more – and even better – was still to come: Entering the 1963/1964 rally winter, the Mini Cooper S was simply oozing power in comparison with its predecessor. 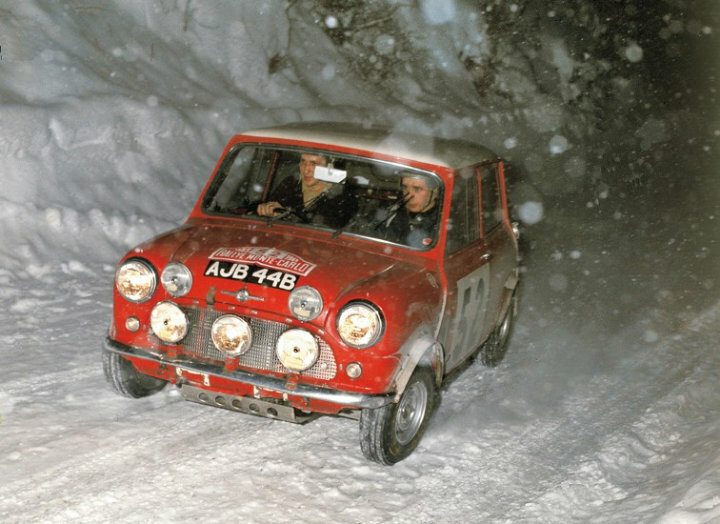 So in a spectacular race, Paddy Hopkirk brought home first place overall in the Monte Carlo Rally, the small performer becoming a legend in motorsport virtually overnight. A year later Finnish racer Timo Mäkinen with his co-pilot Paul Easter repeated the same triumphant victory, reaching the finish line after thousands of kilometres as the only driver without one single penalty point – despite the worst weather imaginable. 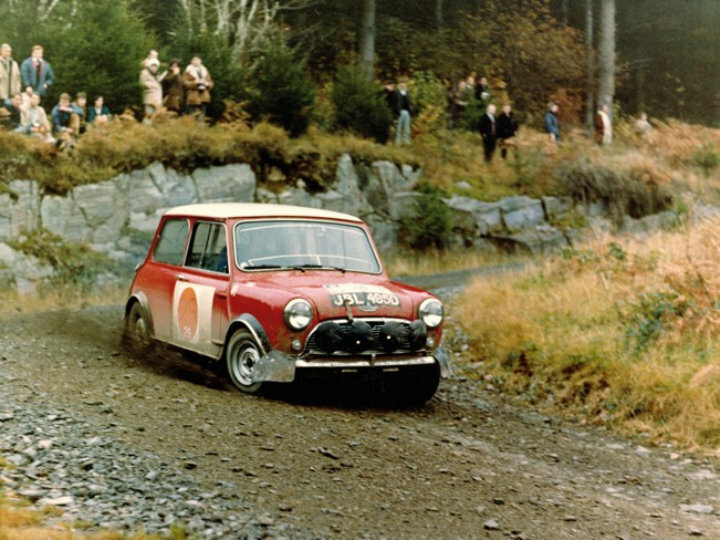 Indeed, only 35 out of 237 cars entered in the event were able to finish the Rally that year, among them no less than three Mini Cooper S.
The following year was the year of the hattrick, Timo Mäkinen, Rauno Aaltonen and Paddy Hopkirk scoring an absolutely incredible victory, finishing first, second, and third. 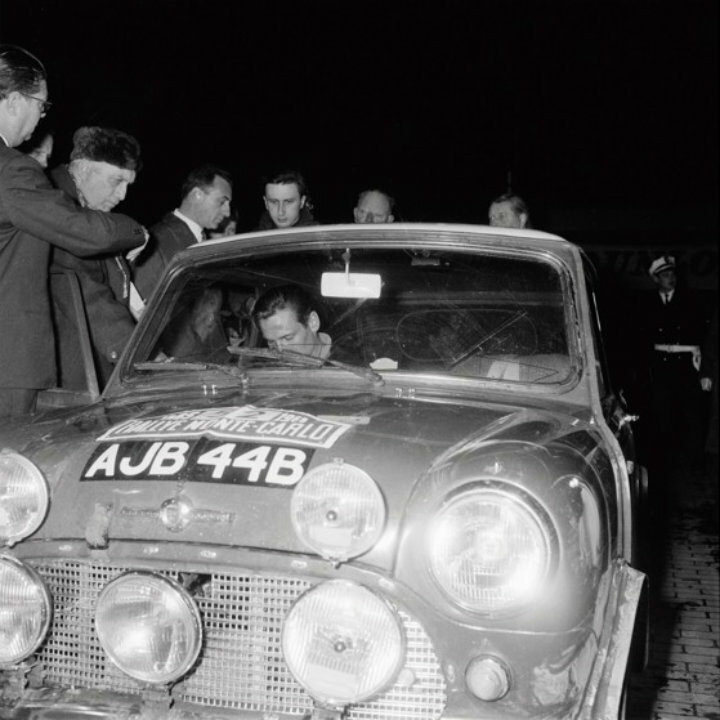 But this was followed by bitter disappointment, the first three cars being disqualified because the rally commissioners came to the conclusion that the low beams on the Mini’s main headlights failed to comply in full with the homologation rules. Even so, the public were completely thrilled by the three Mini drivers, despite this questionable decision, Hopkirk, Aaltonen and Mäkinen therefore entering the annals of the Monte Carlo Rally as the “Three Musketeers”. 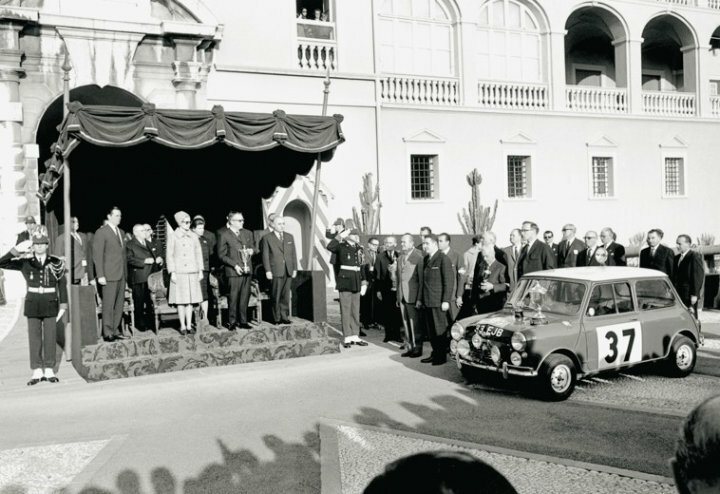 And indeed, just one year later Rauno Aaltonen received truly overwhelming applause and acknowledgement when bringing home the third overall victory of the Mini Cooper S in the Monte Carlo Rally. Especially because this time there were no complaints about his car. 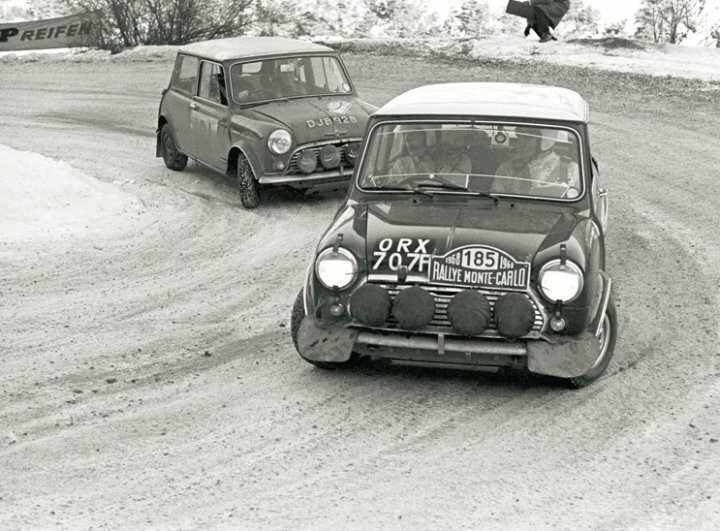 The Mini was however highly successful not only in rally racing, but also on road circuits, bringing home numerous wins in the 1960s. Indeed, through its long list of successes in motorsport, the Mini became the most outstanding racing car of the entire decade. A particularly interesting point is that many spectacular racing careers started at the wheel of a Mini, a certain racing driver from Austria called Nikolaus Andreas Lauda entering his first hill-climb race at the wheel of a classic Mini near the Austrian town of Linz in April 1968, and immediately finishing second. Only two weeks later Lauda again confirmed his talent when scoring his first racing victory in a career which would take him on to three Formula 1 World Championships. And just like Niki Lauda, Formula 1 Champions Graham Hill, Jackie Stewart, John Surtees, Jochen Rindt, and James Hunt all gained their first racing experience in a classic Mini. Just like the car’s sporting career, sales of the Mini Cooper with its special configuration developed by John Cooper Showed an exceptional story of success from 1961–1971, the name “Cooper” becoming a synonym worldwide for passionate driving pleasure in the Mini. The fact that this tiny car had inspired the two-time Formula 1 World Champion to build outstanding sports cars was sufficient proof of the Mini and its qualities. And indeed, the unique driving experience inducing John Cooper right from the start to continue the development of the Mini all the way to perfection was equally thrilling back then for every fan of sporting automobiles. Is BMW re-writing history here? What sports cars besides the Cooper Monaco did they build? 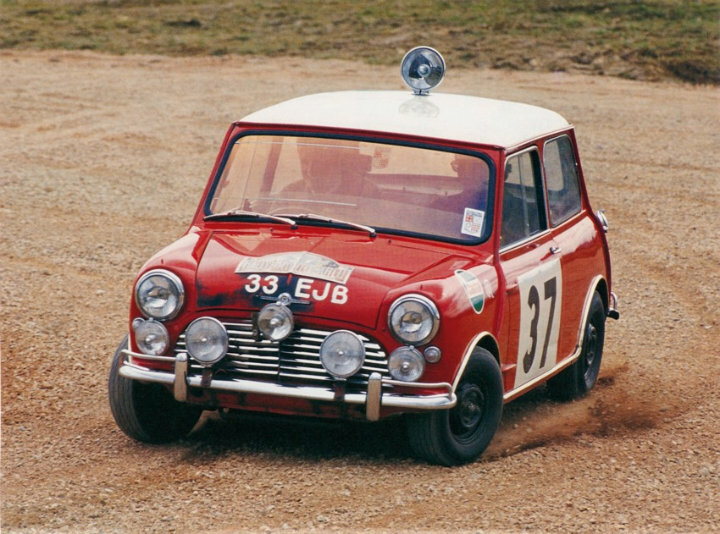 As I recall it the minis always raced as sedans. Cooper’s dedication to rear/mid engined cars came from its overwhelming success in the 500cc F3 with JAP and Norton engines. This was long before the mini came on the scene. Graham Hill did not start his racing career in a Mini !! – he was in an F1 car in 1958 – the year before the Mini was introduced. He did race an Austin A30/35 – which shared the basic “A-series” engine with the Mini. John Surtees debut on 4 wheels was in 1960 – when he combined riding his MV Agusta in Motorcycle GP’s and racing with Ken Tyrell in Formula Junior and Lotus in F1 in 1960. According to his autobiography, Jackie Stewart’s first circuit racer was a Marcos. 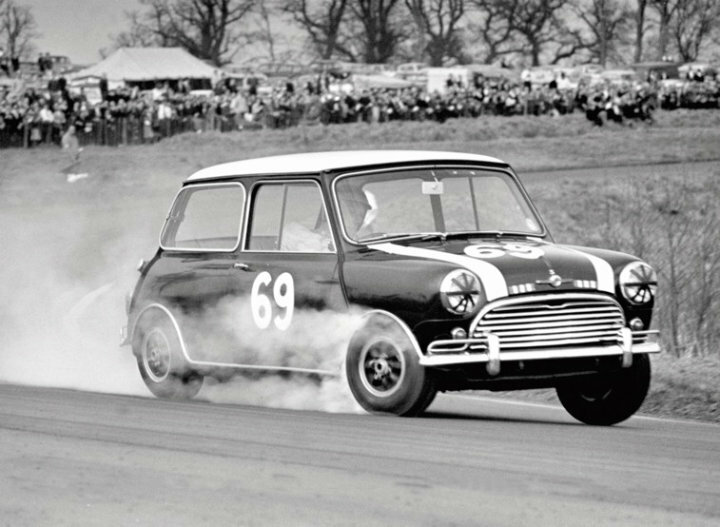 Why no mention of Miss Pat Moss of Great Britain getting the very first Mini win at the ’62 Tulip Rally in a factory works Mini Cooper, a year before Hopkirk won the Monte Carlo in his highly modified JWC Cooper S? *no Austins competed in the other competition class.